We are officially one month from Christmas! The holidays are my favourite time of the year and my family tends to take it to a whole different (and weird) level – think collectible collections (mine are nutcrackers, I have like 20 and it’s really creepy), matching wolf sweaters and hats, and just so much more funny and slightly worrisome exuberance for the holidays. I’m travelling until mid-December which means these intense celebrations (and all my shopping for my family of 6 + Matt, friends, etc) will take place in a pretty short time crunch. Naturally, this has led to me feeling some pre-emptive holiday stress already. Fortunately, I caught myself early before I developed into too much of a stress case, and I’ve got 5 tips after the jump to get you through the holidays in peace and sanity too! Click through to read more! Particularly on the days when you feel like you have no time to exercise…exercise! I let myself get into a major work crunch over the weekend and earlier this week with the thought that I just had to “get through it all” before I took off tomorrow. Of course, this just led to me feeling more stressed, more antsy and also, I’m already eating my weight in food so busting a move really isn’t a bad idea across the board. I got a sweat on today and it made all the difference, both to my energy levels and my sense of calm for the day! 2. Write a stress list. I learned this tip from Marie Forleo and now whenever I enter what I know will be a more stressful period (and I think the holidays are typically stressful for most of us, even if we love it), I write down everything that’s stressing me out. Everything. From that FedEx package I still haven’t picked up to a big campaign I need to wrap up to the Secret Santa party I haven’t put any thought towards, I write it all down. The real magic then is when you start listing out all your solutions – this big, compounded stress ball slowly but surely becomes simple, targeted solutions for each entry on your list. Add some clear timelines and prioritize the new solution list and all of a sudden, you have a solid plan rather than an overwhelming collection of various worries, deadlines and concerns! 3. Make time to be quiet. Whether it’s meditating, having a quiet evening in with your loved ones, an extra long bath – just make sure you take a break from all the parties, all the packed malls and of course, from work. If you ever need help with meditation (my go-to way to get some mental space), see my post here. Feel as if all your friends are intent on more raucous gatherings? Ask a select few over to your place and make it a themed thing – get everyone to bring a snack and just watch Christmas movies. These types of quiet moments are always good for the soul but especially during the holidays. 4. Have a holiday mantra. I’m the first one to admit that I sometimes forget the spirit of the holidays – I get caught up in my editorial calendar, in my shopping list, etc and while our special holiday traditions always bring me into the moment, I feel like I could really make this an opportunity to focus less on the external stressors of the season and more on the chance it gives us to connect. So I’ve developed something of a holiday mantra this year and while it seems embarrassingly simple/corny, it really has already helped me so much: “My presence is the best present.” I’ve been trying to put this to practice since I caught myself in the midst of a stress vortex earlier this week, and already it’s helped so much. I had such a great conversation with my cab driver last night about his studies. I got a chance to ask my favourite bottle guy how he’s been doing and to see what he needed. I had great convos at my girl Erin’s holiday dinner last night. All in all, I just feel like coming back to being present has not only helped me connect more, but it’s really cut my stress down so much because I’m not focused on what’s coming or what passed, just in the present moment and when there is someone there, the person in front of me too. Whether you donate some time to your favourite charity (my family is sponsoring a family for Christmas, and shopping for them is something we split up), send a donation or just grab some lunch for someone in need, taking the holiday spirit of generosity to heart helps take you out of the at-times superficial aspects of the holiday and again, helps you feel connected. Especially with so much going on in the world right now, it’s really the time to do some good. Do you have any strategies for getting through holiday craziness? Tell me in the comments below! Oh, and see where I’m taking off to tomorrow by giving me a follow on Snapchat (@tovogueorbust) and watching it all on Instagram! OMG i am in love with your scarf!!! It os stunning and looks so warm!! The purse and shoes are so fabulous! 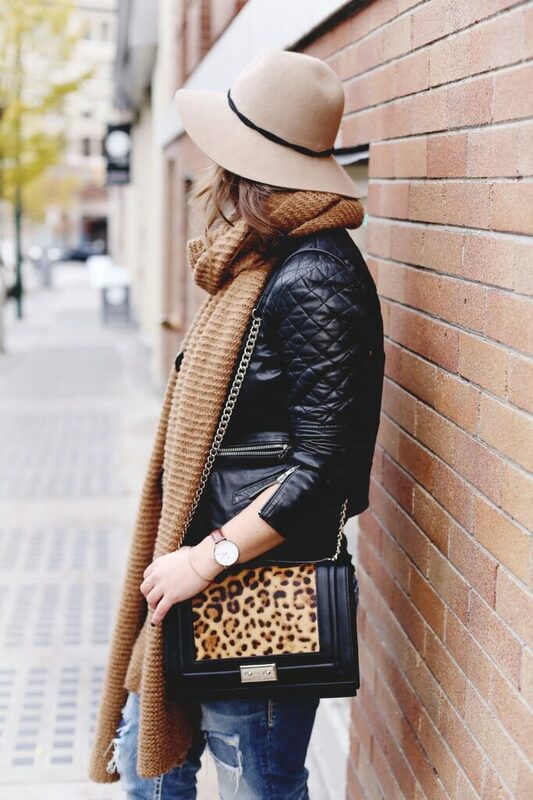 love the pops of leopard print! great scarf too! That oversize scarf looks amazing! Great tips! I love the one about the stress list. Such a wonderful look! Love your bag!